The Customer Data Platform (CDP) is creating major buzz in the martech space as being a key driver in creating more meaningful customer experiences - yet even the savviest of professionals are unclear on what CDPs are and how these sophisticated tools really work. Join this interactive conversation with Tealium CDP Experts to get live answers to your most pressing questions on all things CDP in our “Ask Me Anything” style webinar. Wondering what the benefits are of CDPs? Hoping to understand more about their functionality and integration capabilities with other solutions? Needing advice on how to budget for and buy one? Ask me anything! 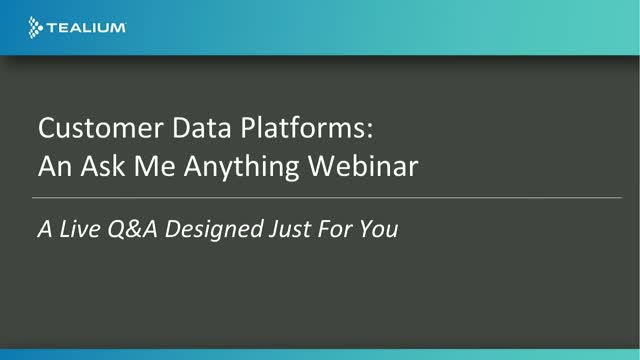 - How is a CDP different than what I’m currently using to manage my customer data? - Why will a CDP help me in driving digital transformation? - How will a CDP help me connect my different data sources to get a single view of my customer? - What criteria should be considered when selecting a CDP?